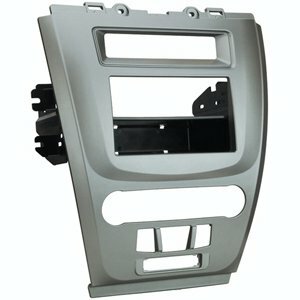 What adhesive to secure plastic filler piece to plastic radio bezel? Thread: What adhesive to secure plastic filler piece to plastic radio bezel? Ok now I'm a bit gun shy with fiberglassing closed an opening on my radio bezel. Last time I glued a piece of 1/2" birch plywood in the opening, then glassed over it with fiberglass reinforced bondo. Well it stress cracked because I didn't use fabric over the 2 pieces. I mainly avoided this because of the build-up. Well I bought a new bezel, and have less to cover up this time. I have about a 1.5" x 6" opening that's slightly curved to seal up. Given the decorative detail of the opening I think I can use some 1/16" abs plastic sheet and cut a filler piece... Maybe just use some kind of 2 part epoxy to glue it in place and then just fill the gap? The top opening is what I need to fill in. I used a plastic epoxy, it stays somewhat flexible.. IIRC it's made by Perma-Poxy. Cool. Might give it a shot. Luckily this time around the piece I'm attaching wont be bearing any weight. So it should stay without cracking. From what I understand when using ABS to ABS I can just purchase ABS plumbing cement? Then if I need it thicker premix it with ABS shavings? That's my basic understanding regarding the abs cement, assuming there is a pressure fit and you're not having to deal with gaps or irregular surfaces. There are some thicker adhesives that work when the surface is irregular (IPS 4707). I am not clear on whether adding shavings is kosher for thickening. yes use 1/8" abs if u can,1/16" will buckle with sun/heat,or if you use epoxy, coat backside of piece with epoxy after you fasten it to dash trim.